What's it like to be 11 months old? If you're Liam and Finn, it's a time full of movement. 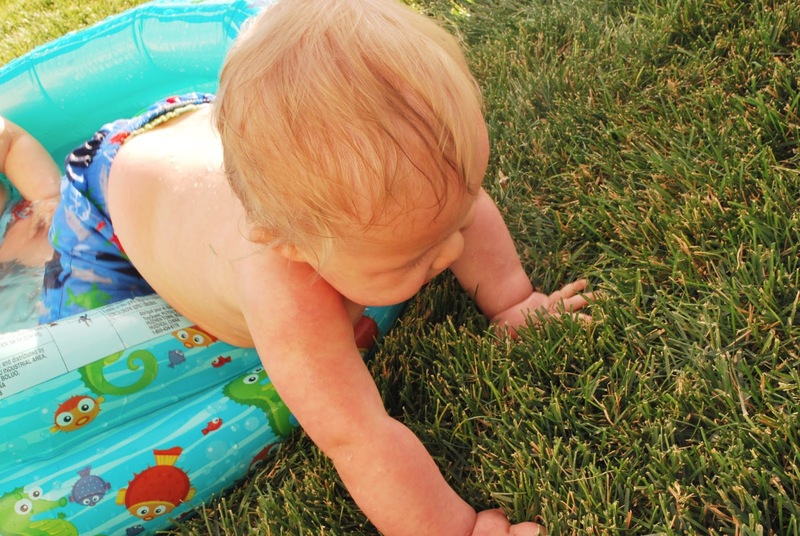 Finn has officially started crawling. Except, a majority of the time he tends to marine crawl on his tummy and pull himself forward with his left arm. It's actually quite humorous to watch. Every day, he gets more and more comfortable crawling on his knees. With this new skill comes new "adventures". Just this weekend, Finn has pulled the ironing board down on top of him, pushed the paper shredder over with all the shredded bits of paper spilling everywhere, taken a head dive off a church bench, pulled out all the DVDs, music, and video games from the shelves, and knocked over the lamp 3 times. We are definitely in baby-proofing mode! On the other hand, Liam hasn't shown a great desire to crawl or become mobile except within the last couple days. But instead of getting on his knees, he prefers to scoot himself on his back and roll to wherever he wants to go. It's also pretty hilarious. Liam has become quite more aggressive with his brother- which is good and bad. When we got back from San Francisco, he had acquired the habit of biting. I was pretty shocked, because I had no idea where he had learned that from. But, as my mom keeps reminding me, it might be the way he tries to defend himself against his bigger and more mobile brother. We've been consistently trying to discourage this and I think it's helped because we haven't noticed as many "bite marks" on Finn's arms. Just kidding! But really, it's gotten better. Both babies LOVE swimming. 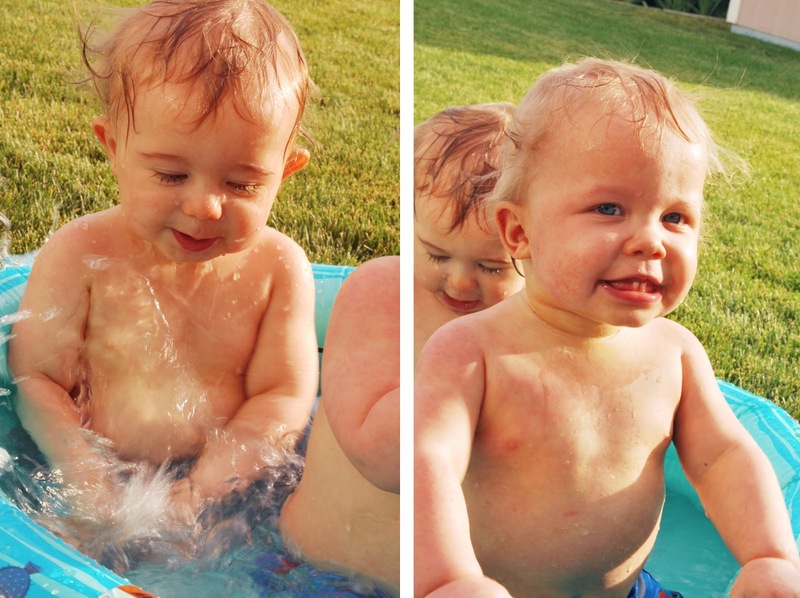 We took them to B's grandparent's pool and Finn fearlessly splashed and put his face under the water. Liam was a little hesitant at first, but soon started splashing and laughing and enjoying himself. I later bought a little splash pool and have used it twice so far. The boys love it! 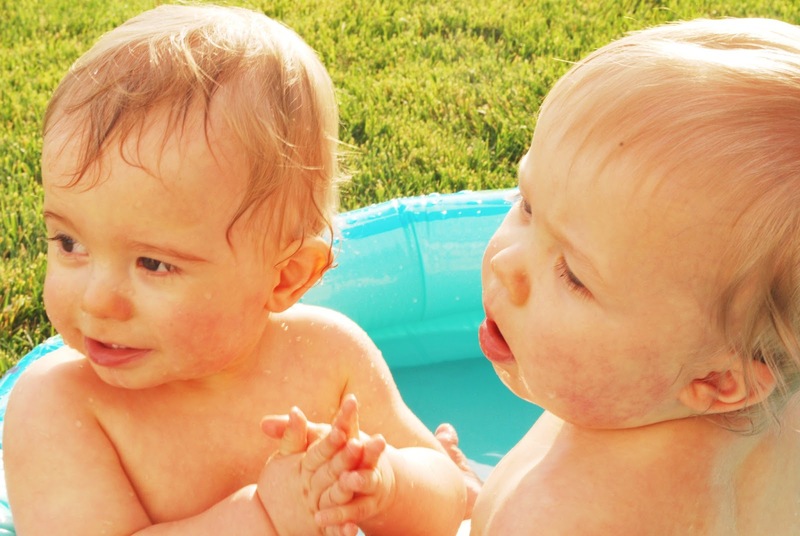 Although, Finn tends to end up sitting on Liam, Liam pushing Finn over, Finn crawling out of the pool, or Liam doing a face plant under the water. Baby boys, I can't believe you are almost 1 year old. Wow, it's true what "they" say: The days are long, but the year is short. You are growing so fast and I love watching you explore the world around you. Each day, your personalities continue to develop and you are quite different. And I love that. Keep growing! Keep exploring! Keep moving! And I will try to keep up!